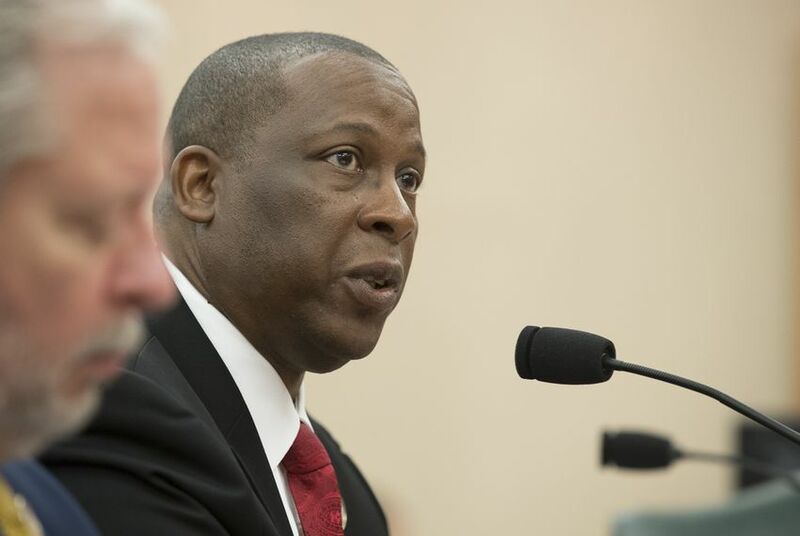 Texas Health and Human Services executive commissioner Charles Smith said during a speech Thursday that his agency is working to improve how it handles contracts. The Texas Health and Human Services Commission won’t fight an auditor coming through their doors — in fact, they welcome it. That’s what Charles Smith, executive commissioner for the state health agency, said just one day after his staff was blasted by state leadership for mishandling state contracts. “We’re not perfect, haven’t been perfect, probably aren’t going to be perfect going forward in the future, but what we’re going to do is we’re going to continue to get better,” Smith said. Smith and agency staff faced scathing criticism from House Speaker Joe Straus on Wednesday after he called for an investigation into why the Texas Health and Human Services Commission allowed a health insurance company to report $29.6 million in bonus and incentive payments paid to medical providers' employees, even though those payments were not allowed under its contract with the state. The news came after legislators took Smith to task last year over not reporting at least 42 contracts worth $100 million or more to the Legislative Budget Board’s database in a timely manner. “The point is we welcome you coming in because if you see things that we didn’t see, then it’s an opportunity for us to improve and ask the question ‘Why didn’t we see that already? What are our checks and balances?,’” Smith said. During the 45-minute keynote in front of more than 100 attendees, Smith touted the agency’s work securing the $25 billion federal waiver funding for hospitals treating uninsured patients; continuing to work on improving the managed care program; and improving health outcomes for Texans who face chronic health issues like high blood pressure, high cholesterol and diabetes. The speech comes a little more than a year and a half into Smith's tenure as head of the Health and Human Services Commission, leading an agency with 60,000 employees and an $80 billion biennial budget despite having no background in health care. During that time, the agency has launched the Healthy Texas Women program; overseen assistance for Hurricane Harvey victims; ensured young patients under the Children’s Health Insurance Plan would have coverage if Congress didn’t renew funding; and merged with two other state agencies. The commission is also watching for changes at the federal level as Congress mulls how to repeal the Affordable Care Act and overhaul Medicaid, the joint federal state health insurance for the poor and disabled. Gov. Greg Abbott promoted Smith from chief deputy executive commissioner to his current post in June 2016. Smith has worked for the governor previously in the attorney general's office, when Abbott was the state’s lead attorney. But Smith’s tenure has been plagued by ongoing accusations from former and current agency workers that he has caved under pressure by Abbott’s office to make policy decisions. The agency has faced backlash over a rule that would require medical providers to cremate or bury fetal remains from abortions and miscarriages; efforts to kick Planned Parenthood out of Medicaid; elimination of the agency’s refugee assistance program; slowness in delivering food assistance to Hurricane Harvey survivors; and dialing back funding to the Heidi Group, an anti-abortion organization, after it failed to attain its patients served goals — a move critics say could’ve been avoided had the agency not given them money in the first place. The organization has also seen the departure of dozens of experienced staff members who say morale has plummeted during Smith's time as executive director and they feel overworked and undervalued. Smith said the agency does a “tremendous amount of work” but that he tells staff “all of the time how much I appreciate their work” because he knows they could go elsewhere and make a higher salary. He went on to say HHSC staff are “hardworking, knowledgeable people.” He said he tries to encourage staff to not get caught up in what the media reports about them. Smith also pushed back on critics' assertion that the exodus of staff has created an institutional "brain drain."